(Nanowerk Spotlight) Using nanoparticles to combat cancer and a host of other diseases is an active area of research for many scientists. For decades, treating cancer has mostly involved injecting patients with toxic drugs. A practice, in which only a fraction of the drugs reach the intended target, killing healthy cells in the process and causing harmful side effects. Previous studies have shown that drug-carrying nanoparticles can accumulate in and attack tumors, in part because of their extremely small size, which helps allow them to pass through cell membranes (see for instance: A new type of nanoparticle to kill cancer cells). However, up until now, existing techniques have meant that targeting agents could only be delivered using spherical or granular shaped particles. Researchers have also found out that the interaction of particles with cells is strongly influenced by particle size, but little is known about the interdependent role that size, shape, and surface chemistry have on cellular internalization and intracellular trafficking. In a previous Nanotechnology Spotlight we described how mathematical modeling could improve the shape efficacy of nanoparticles. Now, a team of scientists have demonstrated that nanoparticles designed with a specific shape, size and surface chemistry are taken up into cells and behave differently within cells depending on the characteristics of the particle. Their findings suggest that HeLa cells (an immortal cell line used in medical research) readily internalize non-spherical particles with dimensions as large as 3 µm using several different mechanisms of endocytosis. Moreover, they found that rod-like particles enjoy an appreciable advantage when it comes to internalization rates, reminiscent of the advantage that many rod-like bacteria have for internalization in non-phagocytic cells. A finding that could lead to new and more effective methods for treating cancer and other diseases, from diabetes and multiple sclerosis to arthritis and obesity. "We employ a top-down particle fabrication technique called PRINT that is able to generate uniform populations of organic micro- and nanoparticles with complete control of size, shape, and surface chemistry" Dr. Joseph M. DeSimone tells Nanowerk. DeSimone, Ph.D., Chancellor’s Eminent Professor of Chemistry in the University of North Carolina (UNC) at Chapel Hill’s College of Arts and Sciences, led a team that focused on extending emerging top-down nanotechnology fabrication techniques from the microelectronics industry for the synthesis of tailorable nanofabricated tools or particles. These techniques allow scientists to gain detailed knowledge of the interdependent effect that key particle variables – such as size, shape, chemical composition, and surface charge – have on cellular entry. The team reported their findings in the August 19, 2008 edition of PNAS ("The effect of particle design on cellular internalization pathways"). Definitive biodistribution maps that establish the interdependency of the size, shape and surface chemistry of nanoparticles in vitro and in vivo over length scales ranging from cells to tissues to the entire organism are needed by many different research communities. Environmental regulators, pulmonologists, oncologists, pharmaceutical scientists, toxicologists, cell biologists and dermatologists all need definitive answers related to particle biodistribution, particle permeability and transport using particles of well-defined shape, size and chemistry. DeSimone explains that nanofabricated tools (e.g. precisely defined particles) hold significant promise to provide insight into the fundamentals of cellular and biological processes. These tools can also yield essential insights into the design of effective vectors for use in nanotechnology applications in medicine, especially for the design of nanoparticles for use as targeted therapeutics and imaging agents. PRINT® (Particle Replication in Non-wetting Templates) technology, a technique invented in DeSimone’s lab and licensed to Liquidia Technologies, allows scientists to design and produce nanoparticles with pre-determined, highly precise size, shape, and chemical composition. Absolute control of these key particle attributes is allowing scientists at UNC and Liquidia to answer fundamental questions about the role of particle shape and size in biodistribution and biological processes. The answers will drive the direction of future research in the areas of drug delivery, imaging and nanomedicine. "Particle fabrication techniques currently available do not have the ability to control the particle attributes with the flexibility and precision available using PRINT" says DeSimone. 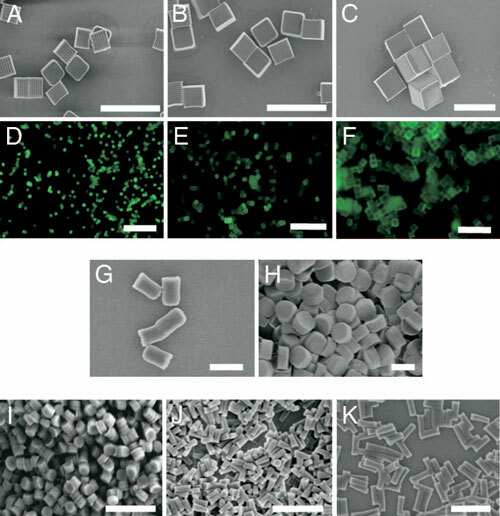 "Using PRINT to fabricate micro- and nanoparticles, we were able to delineate the internalization rates and kinetic profiles for particles which had a range of, but very precisely controlled compositions, shapes and sizes. Current scientific thought is that the upper limit of the size of any nanoparticle internalized into non-phagocytotic cells by means of non-specific endocytosis is 150 nm; thus any particle larger than 150 nm would be excluded from cellular internalization altogether. Our results suggest that this upper size limit convention needs to be raised significantly as we clearly see the internalization of 3 µm, 2 µm and 1 µm sized particles in vitro. To the best of our knowledge this is the first report of the intracellular uptake and transport of biologically-relevant nanoparticles greater than 200 nm into non-phagocytic mammalian cells." The UNC scientists' data also revealed that internalized PRINT particles of any size appear to follow multiple pathways into the cell with a significant diminution of particle internalization in cells when the particles had a negative zeta potential versus particles that had a positive zeta potential. In addition, the internalization of the rod-like, high aspect ratio nanoparticles (d = 150 nm, h = 450 nm) occurs much more rapidly and efficiently than would be expected based on size considerations alone, suggesting a special role associated with the shape of the particles. Using PRINT, scientists can now design and produce 'custom-made' nanoparticles of specific shapes, sizes, compositions and surface chemistries with the aim of optimizing particle attributes for specific therapeutic objectives. PRINT technology can, for the first time, manufacture highly customizable and controllable micro- and nanoparticles from a range of materials for the diagnosis and treatment of disease, with promising applications in biotechnology and pharmaceuticals. This technique combines the advantages of bottom-up self assembly and top-down lithographic technologies. "We are now able to reproduce shapes normally associated with self-assembly using robust nanoscale replication methods" says DeSimone. This novel particle replication technology offers drug discovery and drug development efforts a platform approach to refine, optimize and improve the therapeutic index of their drugs. By being able to control particle attributes such as shape, size, deformability, surface chemistry, and matrix composition, this technique offers an unparalleled tool for control which yields 'calibration quality' particles that are scalable to a continuous GMP (Good Manufacturing Practices) roll-to-roll process. The UNC scientists also point out that their ability to target nanoparticles to cells, and to de-target particles, coupled with a rich range of particle chemistries allows them to release cargos in an intracellular manner. "We also see that sizes and shapes give rise to different cellular uptake kinetics and mechanisms as well as different intracellular distribution profiles" DeSimone points out. "Such findings will open the door to the selective delivery of biological molecules to intracellular targets including mAbs, RNAi therapies and protein therapies." The team's current focus is on in vivo studies where they are trying to elucidate the interdependent influences of particle size, shape, modulus and composition on biodistribution. In particular, they are working with mouse models for in vivo delivery of RNAi therapies, targeted oncology agents and vaccines. In addition, Liquidia Technologies – a company founded on DeSimone's discoveries – is also advancing internal programs in siRNA delivery, vaccines, inhaled therapeutics and other proprietary partner products. Building upon this fundamental study, other important research questions must be answered to determine how to evolve this knowledge into effective targeted therapies. Scientists need to understand how different cell types behave and must develop a better understanding of the micro-environment within the intracellular compartment and how that is influenced by the size, shape, composition and surface chemistry of the particle. They also need to explore whether a specific intra-cellular pathway can be targeted by controlling the attributes of the particle. 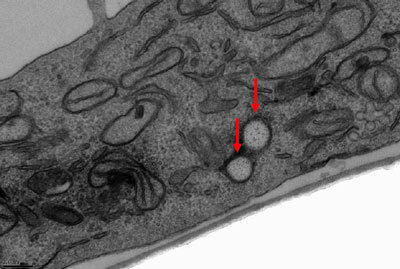 This information can then be used to engineer 'endosomal' escape (endosome is a membrane-bound compartment inside cells) and deliver cargos to the appropriate intracellular location. Another requirement is to understand how the particles, once delivered, distribute in vivo as a function of the particle attributes. And finally, a major challenges facing the future development of all particle-based drug and imaging agent delivery vectors is the ability to design a particle that can evade the body's immune system defenses to produce a particle which can circulate for an extended period of time.